Myself and Sara did this walk on Saturday 9th July 2011. 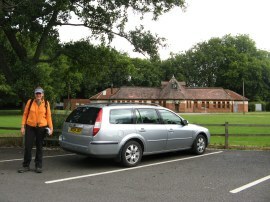 We met up at Bourne End, where we parked up at the station which cost £2 for the day before driving over to Reading to resume the walk. 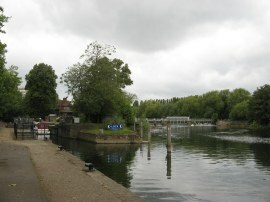 From our parking place in Napier Road, photo 1, which cost £7 for the days parking, we had just a short walk across an area of park back down to rejoin the towpath alongside the Thames, just above Caversham Lock, photo 2. 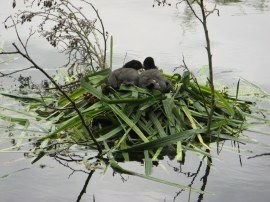 On the river we spotted a pair of coots, cuddled up together on their nest, photo 3. 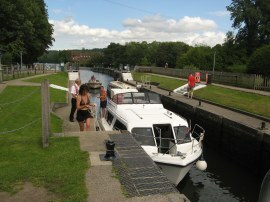 Having passed the lock, the route follows the river along a tree lined path, photo 4, that heads round the edge of Kings Meadow up to a bridge which crosses over the mouth of the Kennet and Avon Canal, photo 5. 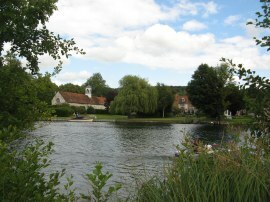 Just below the river on the opposite bank the route passes the entrance to a marina and what looked like a long rowing lake. The path heads alongside another grassy area before joining a predominantly tree lined section of path that leads down to Sonning Lock, photo 6, which if I have been counting correctly is the 23rd lock we have now passed. As with all the locks we have passed the gardens alongside were very well maintained and filled with flowers making a bright splash of colour. 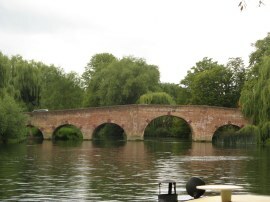 Just below the lock the route crosses Sonning bridge, photo 7, over to the opposite bank. The path then heads over a sub channel of the river and alongside a small area of woodland before once again heading downstream along a path lines with trees along the riverbank and with fields away to the left, photo 8, as we made our way down towards Shiplake. The day had started quite grey and gloomy and for a while it looked like we were going to get caught in a heavy shower that we could see approaching although luckily this passed us by with only a few drops of rain falling where we were and from that point on as the day progressed the weather steadily brightened up. 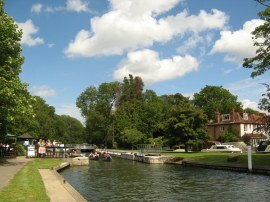 Reaching Shiplake Lock, photo 9, the route once again has to head away from the river, heading to the left up a track towards Mill Road. A hand painted sign close to the lock stated it was three miles to Henley and that the lock was 112 feet above sea level. Crossing Mill Lane the path continues ahead between fields to join Mill Road, which is followed to the right, heading by a number of fine houses in Lower Shiplake. 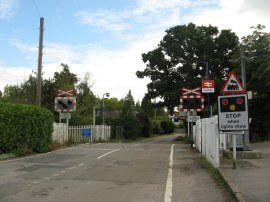 Reaching the junction with Station Road the route heads down to the right, crossing over the level crossing, photo 10, besides the small station before joining a fairly enclosed footpath on the left running behind houses. This leads down to Bolney Road where the route bears to the right, heading between houses to join a footpath running alongside the edge of a driveway at the end of the lane. I have often mentioned that when you are out walking you never know what you are going to see and this was another one of those moments as we spotted that there was a miniature railway line with several branches running through the garden at Bolney Court. 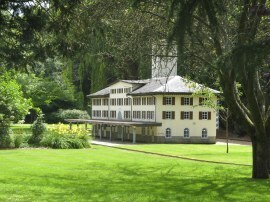 We stopped and took a photo of the track and garden and wondered if there was a station and sure enough, a few paces further on, was very large replica of St Moritz Station, photo 11, built to scale on the lawn. Leaving Bolney Court the route heads besides a riverside meadow to rejoin the towpath running alongside the river with wooded hills, interspersed with houses rising up on the opposite bank, photo 12. From here it is just a short walk down to Marsh Lock. To reach the lock the route heads out along a long wooden causeway, photo 13, which curves round to reach the lock island. 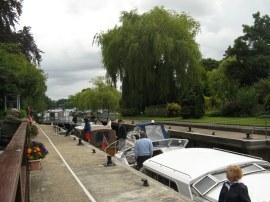 The lock itself, photo 14, was very busy with a large number of boats crammed tightly into the lock and many more waiting downstream to enter. 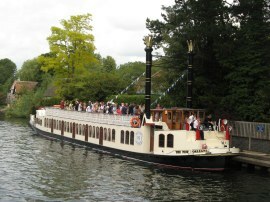 Amongst these was a large paddle steamer, photo 15, complete with band playing away on the top deck. 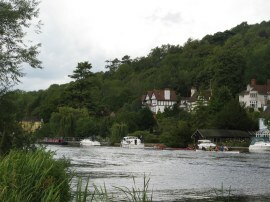 From the lock the path heads across another wooden bridge to the river bank and continues downstream alongside meadows and a recreation ground to reach Henley on Thames. The path here was very busy with people and boats lined the bank. 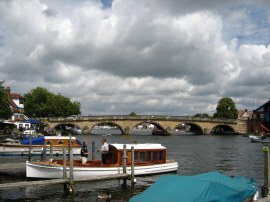 The route crosses over Henley Bridge, photo 16, and head back to the river bank. 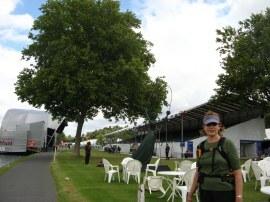 Henley Festival was taking place and the river was lined by hospitality tents and marquees and a big floating stage had been built out over the river opposite a grandstand, photo 17. Signs warned of footpath diversions but none were in force and we were able to make our way unimpeded along the towpath. 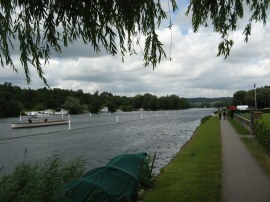 For the next mile or so the towpath runs alongside the wooden stakes in the river that mark the Henley Regatta Course, photo 18. 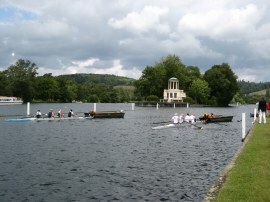 As well as the festival there were also rowing races taking place and we were passed by a number of boats, ranging from single oarsmen up to eights, racing upstream along the course, each being trailed by an umpires boat, photo 19. 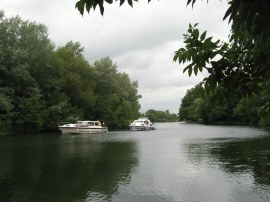 Reaching the end of the course by Temple Island, photo 20, the path heads alongside an area of open meadows as the river Thames, which had been heading in a northerly direction begins heading round in a large curve to take a more southerly course. Here we stopped for our lunch break in a handily sited bench opposite Greenlands, photo 21, which was once the home of WH Smith. As we were eating a women walked past with three dogs in tow, one of which had been rolling in something very smell, and Sara gave her some of her hand wash gel once she had finished cleaning off the dog in the river. 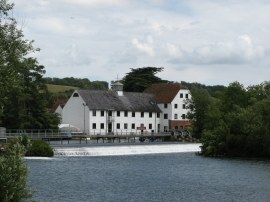 From our lunch spot it was only a short walk further to Hambleden Lock, photo 22, and just below, visible on the opposite side of the river was Hambleden Mill, photo 23. The route then runs along the edge of another field before once again having to head inland at the site of the old Aston Ferry crossing. 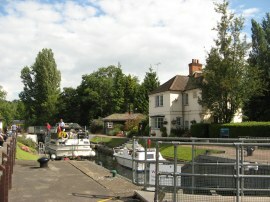 The Thames Path heads up Aston Ferry Lane. 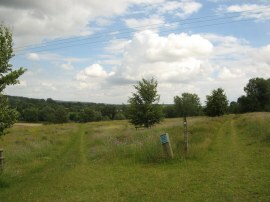 Just past the Flowerpot pub the route heads to the left along the driveway to a farm before heading out along a very pleasant track running across a meadow where there was a large variety of wild flowers in bloom amongst the grass, photo 24. 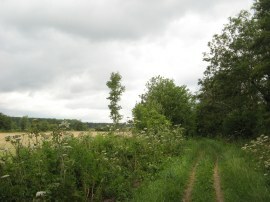 The path heads below Culham Court, bearing to the left to join a farm track. This is followed down to a gate where the Thames Path heads the left across a meadow that was being grazed by cattle when we by which leads back to the river bank. The path then heads alongside the edge of a number of meadows with the river once again lined by a fringe of trees. 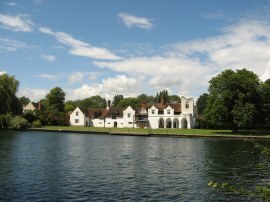 On the opposite bank the path passes Medmenham Abbey, photo 25, where the few remains of the original abbey have been incorporated into a private house. 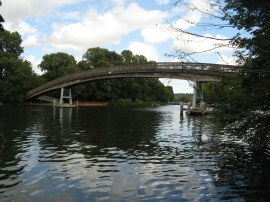 This also marks the point where the towpath once again crossed back over the river. The official route takes a short cut here across the middle of the field but we followed the path along the waters edge. The weather had been steadily warming up and we had a short break while Sara changed into shorts and lighter T shirt. The route then heads by the converted barns of Frogmill and down alongside another grassy area towards Hurley Lock. For a while the path runs close to a large caravan park and the area of river bank was popular with families out enjoying the sun, including a number of people out swimming in the river, something I almost feel I should have tried at some point during our walk though I doubt the water would have been warm enough for me. 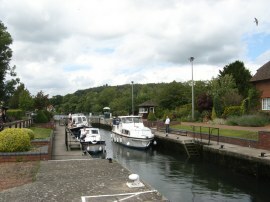 The path heads over a wooden bridge to the lock island and past the lock, photo 26, before crossing another bridge back over the lock channel. The route then joins a short secion of surface track before heading through an area of trees to reach the Temple Footbridge, photo 27. 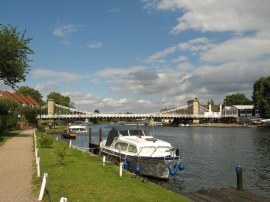 The bridge was built in 1989 specifically for walkers on the Thames Path at the site of the old Temple ferry which ceased operation in 1953. 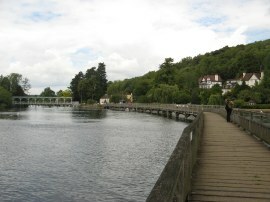 At 88 yards it is the longest hardwood bridge in Britain. 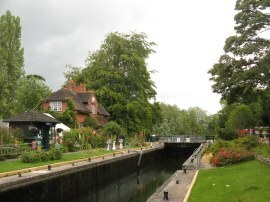 From the footbridge the path soon reaches Temple Lock, photo 28. 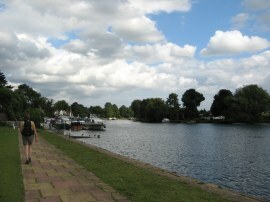 The path then runs alongside a succession of river side fields as the Thames makes its way towards Marlow. 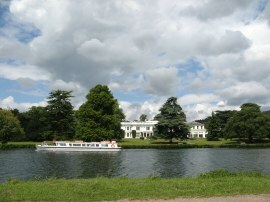 On the opposite bank the river passes the site of Bisham Abbey, photo 29, which is now used as is one of Sport England's National Sports Centres as well as being a site for weddings and it looked like a reception was taking place on the riverside lawns when we went past. 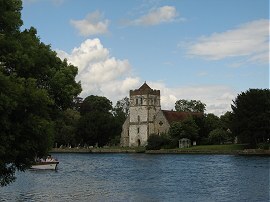 A little further downstream was the picturesque All Saints’ Church, situated next to the river, photo 30. Approaching Marlow the suspension bridge, photo 31, and tall spire of All Saint's Church come into view. 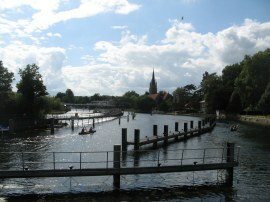 The route joins a well surfaced section of path which is followed up past a number of riverside houses to reach the Marlow Bridge where the route heads briefly to the left before crossing over the road and heading through the churchyard of All Saints Church, photo 32. Leaving the churchyard the route crosses St Peters Street and then joins a narrow alleyway which winds its way round a number of buildings to Mill Road. 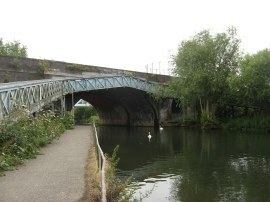 Here the route heads to the right before following the road round to the left where it is now running parallel to the river. The Thames Path continues along the road for a while but first we made a short detour down a path on the right which leads the few yards down to Marlow Lock, photo 33. Looking up from the lock there were good views upstream over the various weirs and channels back to the centre of Marlow, photo 34. Just after Mill Road bends to the left the Thames Path heads back done to the river alongside the edge of a an area of park type land. A sign here said it was now just two miles to our destination at Bourne End although it turned out to be nearer to three miles. Once back at the river the path soon passes under the A404 dual carriageway and then once again head downstream alongside fields and meadows, photo 35, with the tree lined slopes of Winter Hill rising up on the opposite side of the river. Maybe it was because I was starting to feel a bit tired after the days but this part of the walk seemed rather dull and I only took a few photos as we headed down to Bourne End. The railway line gradually runs closer to the path on the left and eventually we joined a section of path on the outskirts of Bourne End that runs between houses and their small patches of river front gardens. 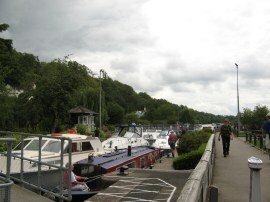 This leads to Upper Thames Sailing Club and a little further on a small marina where there were a large number of boats lined up alongside the riverbank, some of which were sale with even the smaller boats costing in the region of £20,000. From here it was just a short walk further to reach the rail bridge across the River Thames which marked the end of this stage of our walk. From the bridge we joined a footpath that headed directly up to our parking place at Bourne End station. Reaching the car we had walked a total distance of 21.3 miles, our longest stage along the Thames so far. 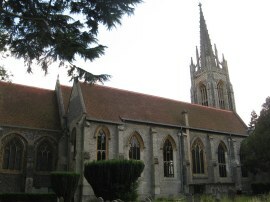 We then drove over to collect Sara's car in Reading before heading over to Marlow and our B&B for the night. The river side is definitely becoming less rural in nature as we start heading closer and closer towards London with more people about on the river bank and the land either side of the river managed in a more intensive way than back out near the start of the walk. 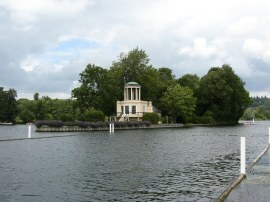 This does however give more to see and both Marlow and Henley were very attractive towns that I had not previously visited. As mentioned earlier we were lucky with the weather as there had been showers about and when it did brighten up it did not get uncomfortably hot like on the previous stage, all in all another good days walking. The only slight niggle was that by the end of the walk the soles of my feet were feeling very tired, I know we walked a fair distance but they felt far worse than than 22 mile walk I did along the Green Chain Walk in Febraury and large chunks of that had been on pavement. Hopefully this is something that won't reoccur. 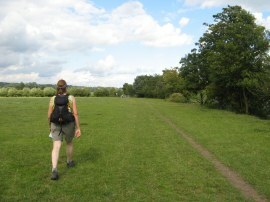 As usual I have uploaded the route of the walk which can be accessed here: Thames Path Stage 8 Route.